You hear a lot of advice from people when you are thinking of setting up a podcast. People have all sorts of opinions about how long episodes should be, what you should talk about, how you should talk, how often you should release episodes. I’m not sure any of them are right. Think about the podcasts you listen to. Are they all the same length as each other? All the same format? All series or all regular? I doubt it. I’m the host of The Cosmic Shed podcast which was recently named as one of the Guardian’s favourite podcasts of 2018. It’s recorded in the crumbling garden shed at the bottom of my garden, somewhere in suburban Bristol. 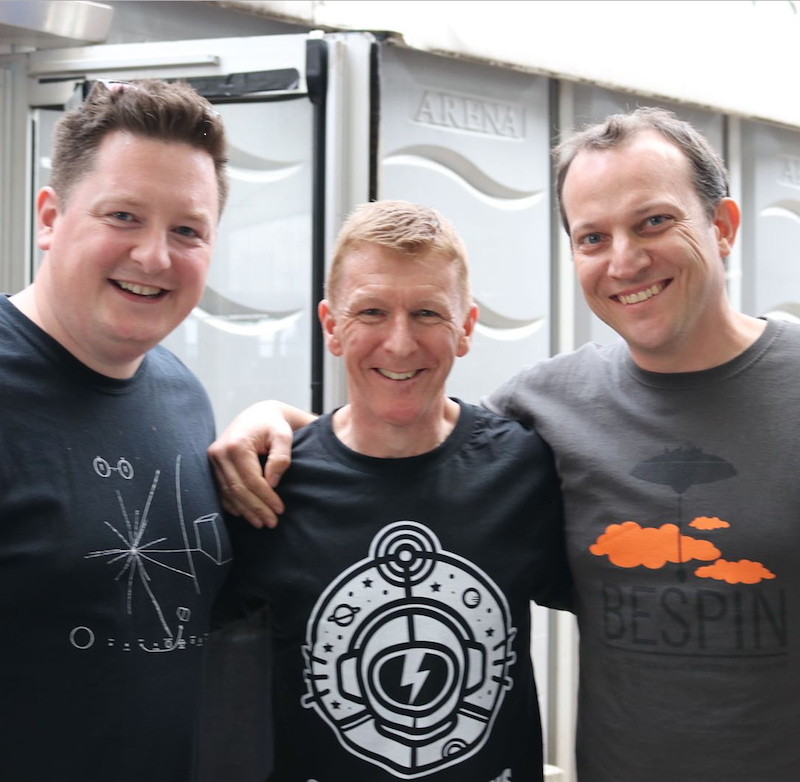 It really is an awful shed but guests on the podcast include Tim Peake, Alice Roberts, Benedict Cumberbatch, Nichelle Nichols and Chris Hadfield. We discuss science fact, science fiction and everything in between. 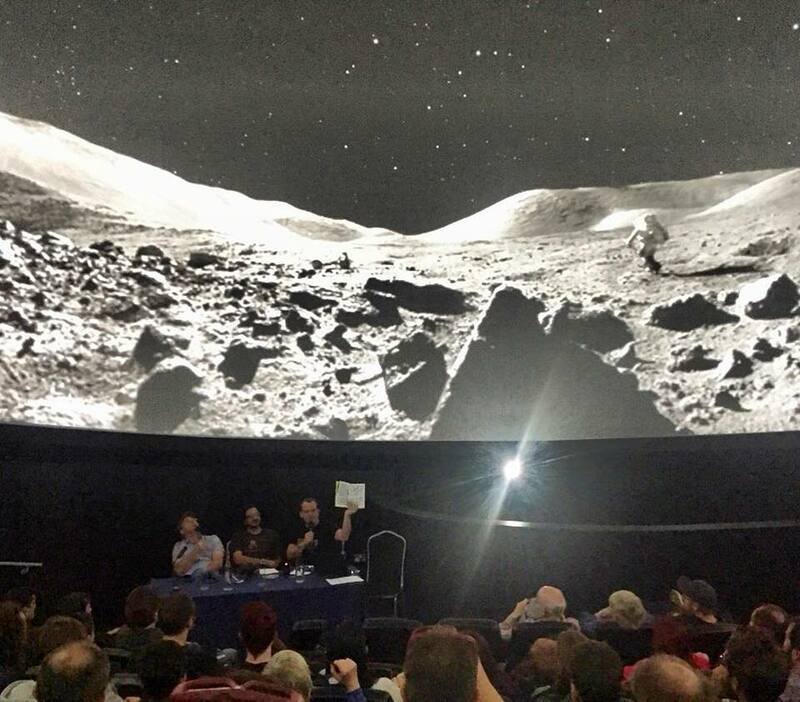 Occasionally we take the podcast on the road for live events, like our takeover of Bristol’s planetarium with Andy Weir, the author of The Martian. Podcasts are what the hosts make them to be. If you’re thinking of setting one up, think about what your favourite podcast are and why you like them. The thing that the best all have in common is that the people hosting and presenting them have a huge passion for their topics. That passion is infectious and vital for the listener but it takes many forms. My favourite podcasts are a mixture of scripted, well researched shows like Caliphate and RadioLab and the more relaxed, informal formats like Spooktator and The Adam Buxton podcast. 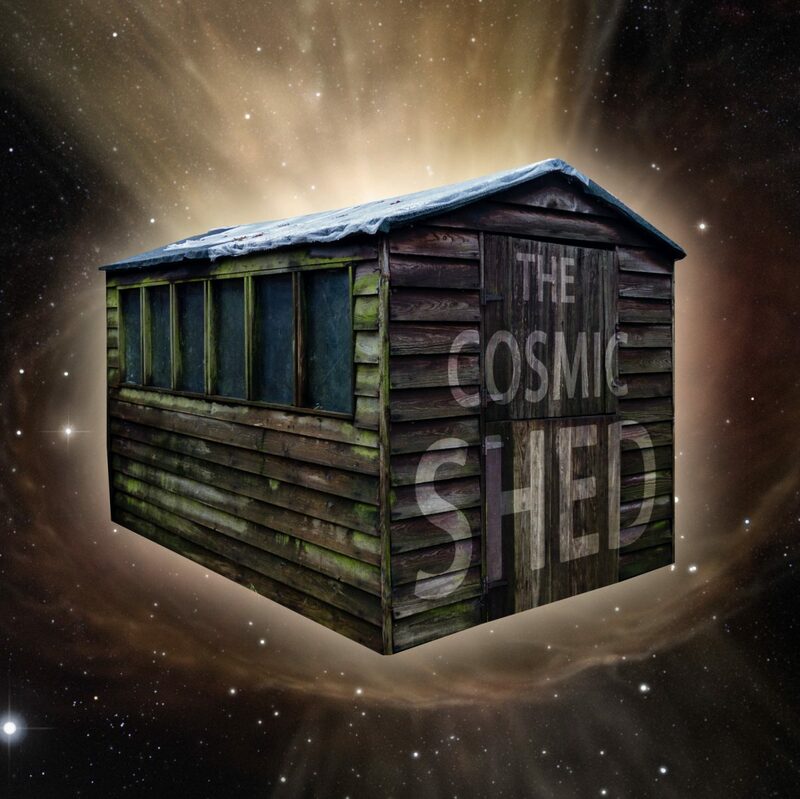 The idea for The Cosmic Shed came to me while I was studying for the MSc in Science Communication at UWE. I had recently moved to Bristol and bought a house which needed a lot of work. A lot of work. Water came up through the floor and down through the ceiling. The waste pipe from the toilet went out onto the roof. That’s the end of that sentence but I would add that this part of the roof did not leak. In the garden stood a shed. A truly awful, rotting shed with more holes than the house and half the floor missing. “That looks like a great place to record a podcast”, I thought. 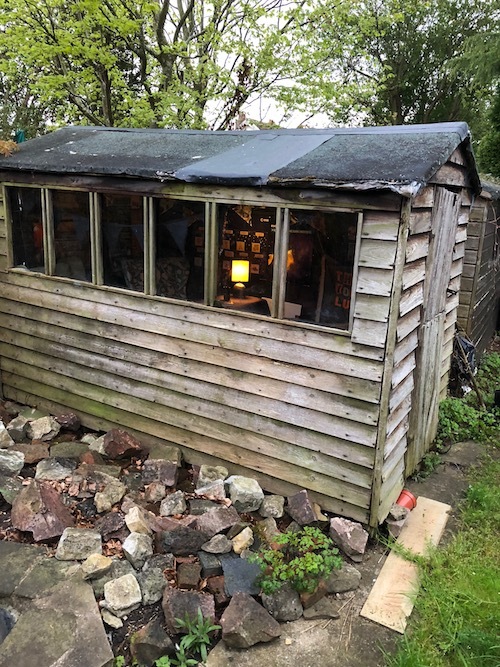 Several years later, The Cosmic Shed podcast has over 100 episodes, won awards and, yet, the shed still looks awful from the outside. 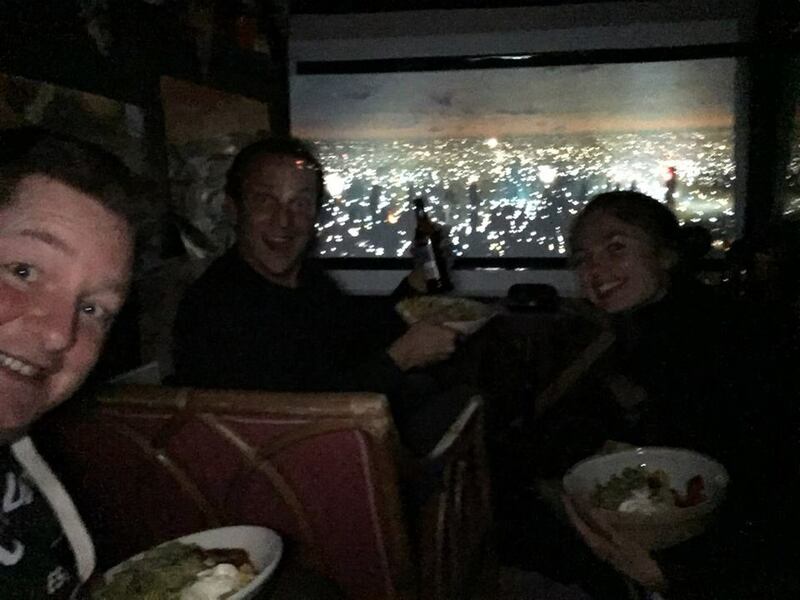 The shed is considerably better on the inside – watching Blade Runner! 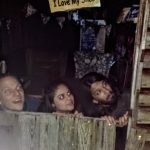 There are a cohort of co-hosts for the Cosmic Shed. We have a nanoscientist Dr Maddy Nichols, an aerospace engineer Dr Steve Bullock, a film nerd (understatement) Timon Singh and more regular guest/hosts like Tushna Commisariat (Physics World) and Achintya Rao (CERN). We all have our own expertise and our own loves of science fiction. Achtinya Rao and Tushna Commissariat in the shed to discuss October Sky. We get a fair amount of correspondence from people who tell us that we are like friends to them. They look forward to our episodes and feel like they are sitting in the shed with us as they listen. If you think of your favourite podcasts, I suspect you’ll find most of them have regular hosts who you get to know and like. It’s one of the main reasons why people like podcasts. Not that that is deliberate from our point of view. I believe that it’s just a natural consequence of the way we record the podcast. 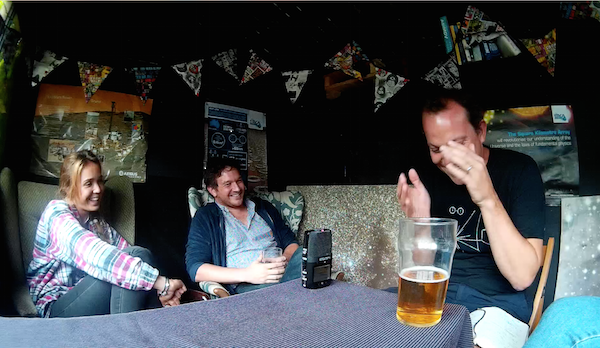 The Guardian newspaper described us as a “light-hearted, curious and nerdy listen” and I think that’s what you get if you put a group of friends in a terrible shed, watch a bit of science fiction and record the conversation. Your podcast should be as long as you want it to be, as often as you want it to be and about what you want to it be about. That way, you’ll enjoy doing it as much as your listeners love listening to it. If you are a podcaster or you are thinking of becoming one, do feel free to get in touch. I’d be delighted to have a chat with you but beware. The first question anyone asks me is how we get such brilliant guests. I never answer it. As 2018 draws to a close, it’s over 15 years since we launched our first postgraduate programme in Science Communication. Today, we’re delighted to be launching our latest offering, designed to meet the needs of students wherever they are based. As our MSc Science Communication and Postgraduate Certificate in Practical Science Communication grow in numbers year on year, we’ve become more and more conscious that science communication is a growing field, both in the UK and internationally, but not everyone who would like to develop their expertise is able to travel to Bristol to study with us. 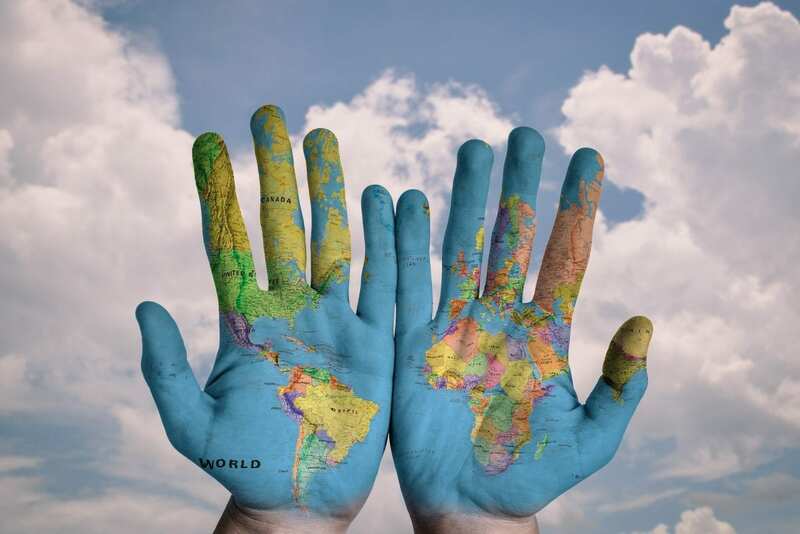 Over the last three years we’ve provided two, entirely online, CPD courses in science communication, which have provided training to over 100 students around the globe. Drawing on the learning we’ve gained from delivering these courses, we are pleased to offer the next generation of science communication students the chance to study for a Postgraduate Diploma in Applied Science Communication, without ever visiting our campus here in Bristol. The programme has been designed to provide students with an applied and practical introduction to the science communication field, alongside the opportunity to develop their understanding of science communication research and techniques. The programme is intended to appeal to students with interests in face-to-face science communication (such as festivals and museums), science communication in digital environments, as well as the written form. A final research skills and project module will also equip students with key skills in science communication research and evaluation techniques. Students will leave the programme with all of the skills necessary to both convey and communicate scientific concepts, and assess the impact of that communication. Thus, the programme will appeal to recent graduates and those already working in the field alike. One unique aspect of this programme, for UWE Bristol, is its entirely online delivery format. This will allow students, wherever they are based, and alongside other commitments, to undertake a UK science communication qualification. Students will also be able to direct their learning towards topics and examples of relevance to them, in their home and working environments, as well as cultural contexts, and even though it’s online, we’ll be using the latest techniques to help them to network with our staff, as well as each other. In developing this new programme we’ve worked with staff throughout our team, as well as having input and insights from our current postgraduate students and stakeholders who are working in the field. The stakeholders we spoke to, many of whom are already employing some of our past graduate students, commented on the contemporary relevance of the programme, the connection of assessments to real situations students will face in their employment contexts, and the opportunities for students to build portfolios and practice in a varied way. We’re now recruiting students who would like to start this programme in January 2019, you can contact Jane.Wooster@uwe.ac.uk for further information and find out more on the programme here. We are also able to offer discounts to students who have previously studied an online CPD course with us. When it comes to food, music and fashion, the interesting stuff often emerges at the interfaces between styles and cultures. When sounds, flavours and cultures collide, the results can be fresh and thought-provoking. Science is no different. From my experience, it’s often the spaces where academic research blends with politics and culture that provide the most interesting stories. As journalists, we should always be on the lookout for these stories, as they can be the gift that keeps on giving. 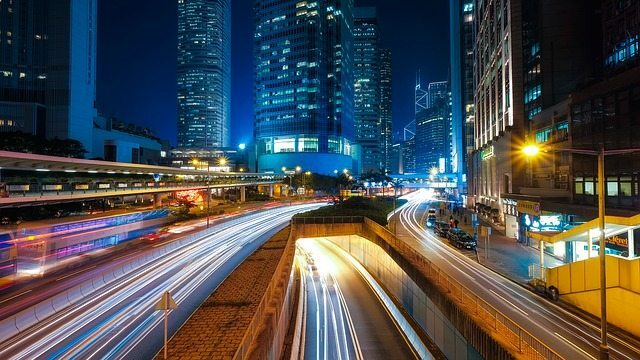 One area that undoubtedly falls into this category is the transition to low-carbon energy technologies. Or to put it a more human way: the quest for sources of energy that let us live fulfilling lives without destroying the planet in the process. These stories are multi-faceted, so I would advise you to collaborate with others, then think beyond the single piece of content. If the story has lots of angles, you can share it in many ways in many places. I’m a multimedia journalist working for Physics World, the magazine of the Institute of Physics (IOP). At the start of 2018, we decided to launch a new film series that explores how science and technology can help us to tackle global environmental challenges. I was on the hunt for stories. For one of the films, our environmental editor, Liz Kalaugher , pointed me towards an interesting academic paper published in one of IOP’s academic journals, Environmental Research Letters. 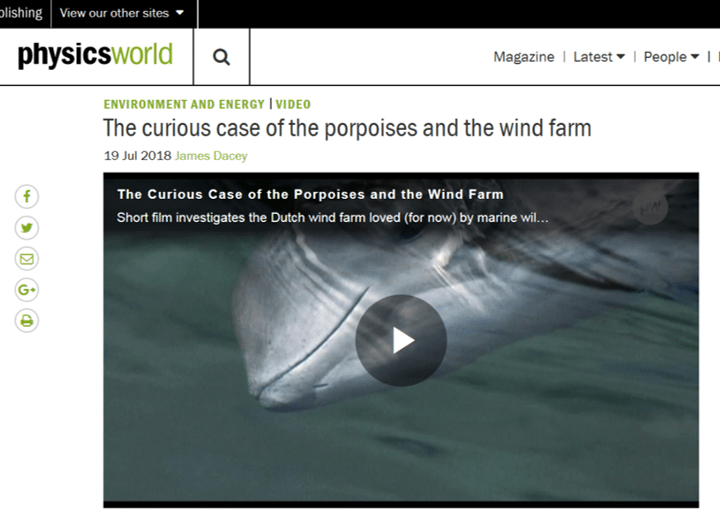 The paper documented an interesting ecology case involving a North Sea wind farm built off the Dutch coast. 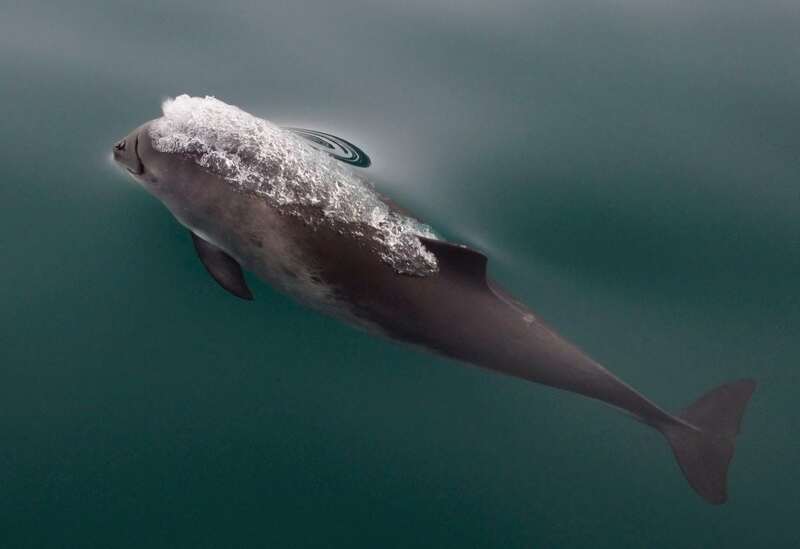 Scientists, led by Meike Scheidat from Wageningen University, had observed that the local population of harbour porpoise appeared to have grown since the wind park was built – a surprising result given so much infrastructure had just been plonked in a natural marine habitat. So far, so straightforward. But I had also learned that since the wind farm was installed, fishing vessels had been banned in this patch of sea 10–18 km from the coastal town of Egmond aan Zee. So was it simply that the porpoises had more food now because of the absence of fishing, while those same ships were depriving porpoises of their dinner elsewhere? 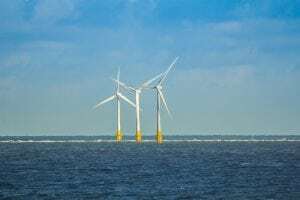 Another theory suggested that the base of the wind turbines had created an artificial reef environment, attracting more fish thus creating more foraging opportunities for the porpoises. However, some unrelated studies of other offshore wind farms in the North Sea had found the opposite result – a decline in harbour porpoise in the vicinity of new offshore wind farms. So we cannot generalise and say all offshore windfarms are positive for porpoises. Was there something unique with the ecosystem by the Egmond aan Zee windfarm? Meanwhile, we had also learned that some in the fishing community were said to be unhappy with the shipping ban, especially the lack of meaningful consultation over a decision that affects their livelihoods. So we had conflicting science on a timely issue, given the recent boom in offshore wind projects in the North Sea. We also had a human conflict. It was quickly shaping into a great story. Identified a Dutch-based science filmmaker Saskia Madlener , who could help shape the story with her expertise and local knowledge. To approach the issue from different angles we interviewed Meike (the scientist behind the original study), Henk Kouwenhoven an engineer involved in the wind farm design, and Rems Cramer a member of the local fishing community. Having shot the film over a couple of days, I wrote a blog article about the trip on my way home. In horrible business speak, publishing that article helped improved the return-on-investment. More importantly, it helped me to highlight the issues and to shape the narrative of the film. Once the film was published, we included it alongside a range of other videos and articles in a new collection called Sustainable Futures . 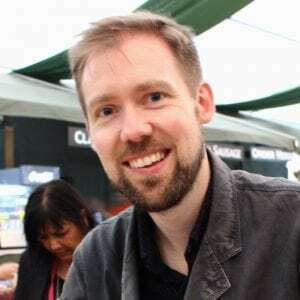 I also spoke about it on the Physics World Weekly podcast. Over the past few months, I have been sharing the film across our social media pages and email newswires, taking every opportunity to plug it. Recently, I have arranged for the films to be shared at American Geophysical Union Fall in December, one of the most important annual global events for geoscientists. Think about how the science interacts with society, then consider all the different angles and stakeholders for your story. Think about the different platforms and formats you present your story, and the ways you can adjust it to suit the site (A video? an article? Share a photo of the film shoot on Instagram?). Don’t be afraid to shout about your stories. The internet is a big place, your story is very unlikely to clog up people’s newsfeeds. Involve people who know what they’re talking. Interview people involved with the research but also those affected by it. If you have any ideas for stories, whether its video, audio or good old-fashioned written words, then please get in touch. Email pwld@iop.org or drop me a message on Twitter @jamesdacey. 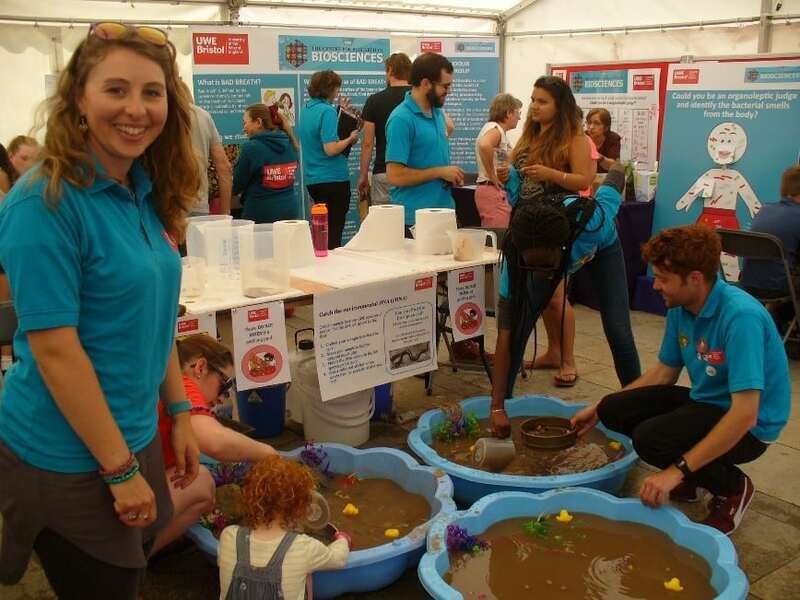 May and June saw staff and students from the Science Communication Unit prepare for the Bristol and Bath Festival of Nature, run by the Bristol Natural History Consortium, of which UWE Bristol is a consortium member. 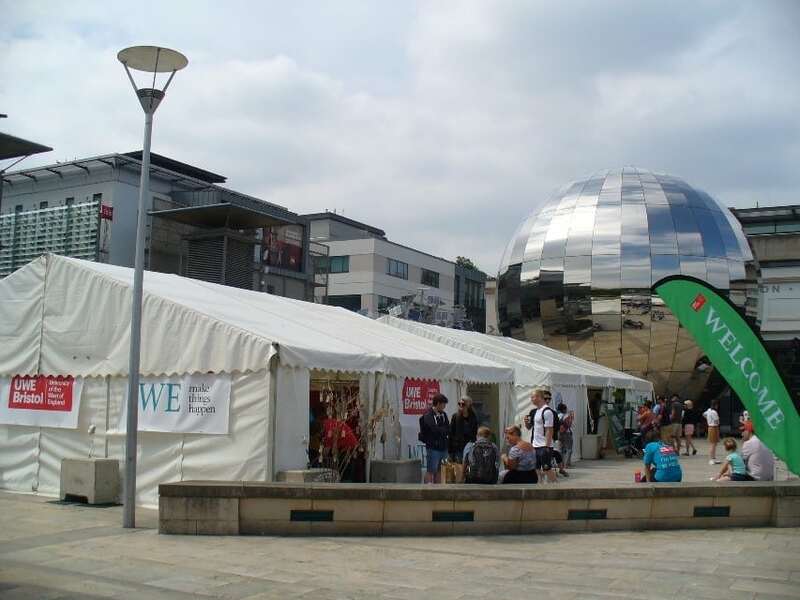 For many years now, research and teaching from the Department of Applied Sciences and the Science Communication Unit have been an important part of UWE’s contribution to the Festival, alongside contributions from a variety of research projects from across the university. This year, the Department of Applied Sciences showcased research by Stephanie Sargeant and team (eDNA and eel conservation), Ruth Morse and team (genetics research on chemotherapy), and by Saliha Saad and team (oral microbiology research on oral malodour), with activities that were developed by MSc Science Communication students. An EU funded project on air pollution, ClairCity, also showcased work that had been produced by a Postgraduate Certificate student as part of the Science in Public Spacesmodule. Dr Stephanie Sargeant and MSc student Jake Campton getting their hands wet with their activity on eDNA and eel conservation. 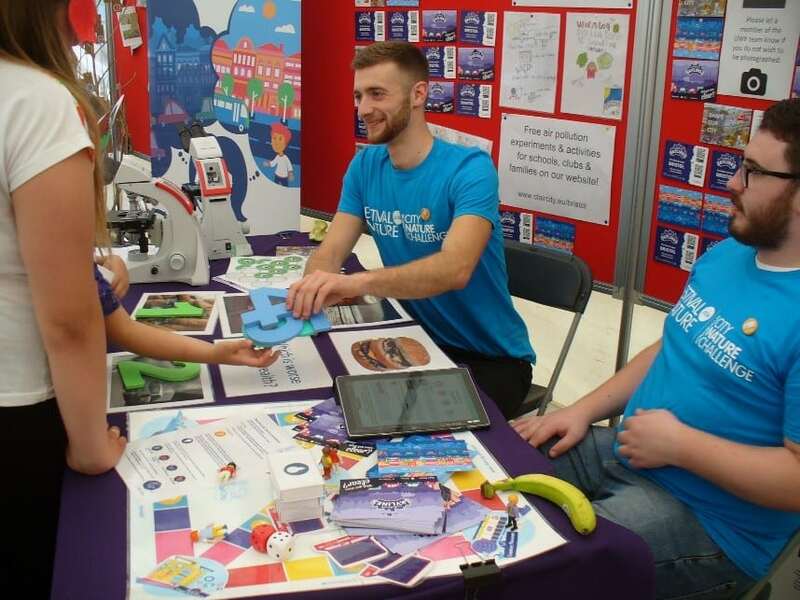 The activities on eDNA and genetics were developed by students of the MSc in Science communication Jake Campton and Sophie Smith and supported by postgraduate students as part of the public engagement element of their portfolio. The activity on oral malodour was supported by CRIB through the BoxEd project, led by Debbie Lewis. MSc in Science Communication student Jennie French ran the final vote of a photography competition on Nature in and around Bristol and Bath, entirely organised from her own initiative. Science Communication Unit staff from the Faculty of Health and Applied Sciences ran a stall for the Our City Our Health project, which included a board game which engaged people in weighing up the costs to health of our built environment, and a 3-metre sculpture of a diesel soot particle, created by local artist Luke Jerram entitled Inhale, that featured prominently outside UWE’s tent and attracted significant attention from visitors and press. Science Communication Unit staff from the Faculty of Engineering and Technology showcased the ClairCity project, which communicated about citizen-led air pollution reduction, and also allowed people to view real diesel soot particles through microscopes – thee million times smaller than the Our City Our Health sculpture outside. The ClairCity stand included the board game made by PG Cert student Zoe Trinder-Widdess, raising awareness of the health impacts of air pollution. 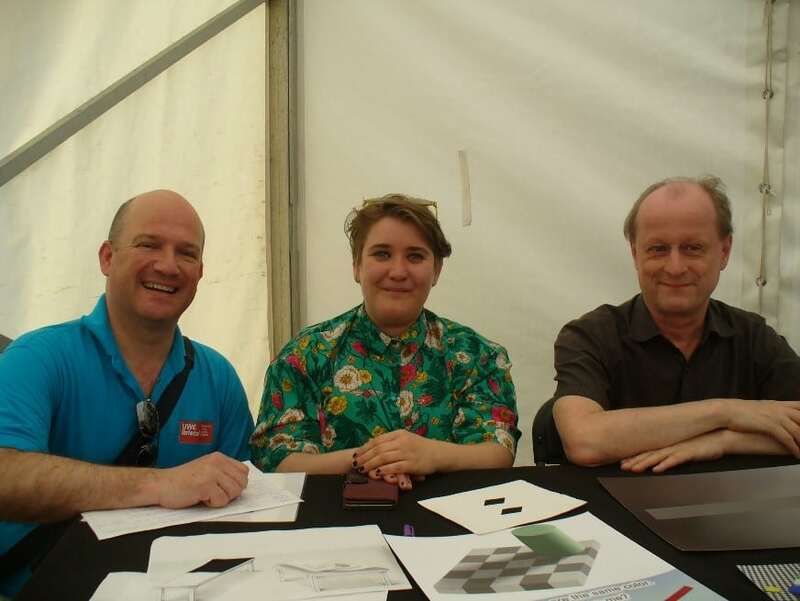 Our presence at the Festival reached well beyond the space of the UWE tent. Many Science Communication MSc students of the current cohort were helping as volunteers for the Festival as a whole, or representing their workplace in the corresponding tents. 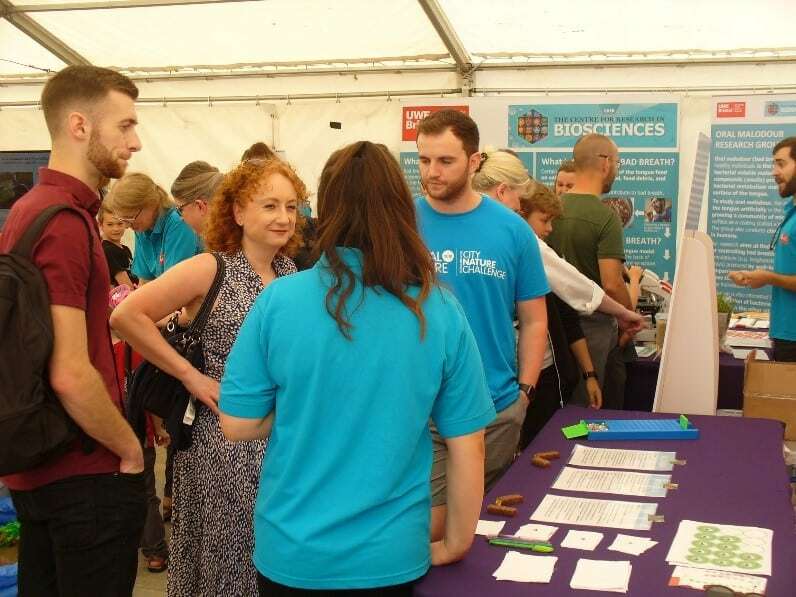 Films made by many of the MSc students were being shown several times a day on the Big Screen presiding over Millennium Square, and Dr Hannah Little was helping at the stall of the British Science Association. 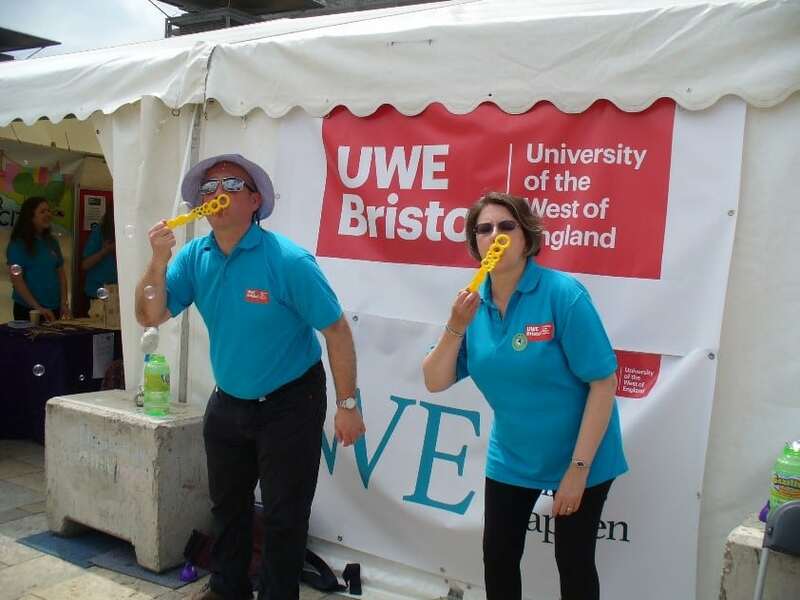 Good weather, a festive atmosphere and the enthusiasm and hard work of all involved made the event a success, with more than 15000 visitors, most of which (it felt like all of them, really) engaged with the activities of UWE Bristol’s tent. It will not be long before preparations for the 2019 edition of the Festival begin, providing a new opportunity for HAS to celebrate its commitment to research, teaching and public engagement at this fantastic event. This time last year during our MSc Science Communication at UWE Bristol, we were buried under a mountain of coursework deadlines, research proposals and that creeping question of ‘what next’? We never thought that so soon after that joyous dissertation hand-in day we would be off on a sci-comm adventure to Hong Kong, to make a documentary and inspire 10,000 local school children to study science! We teamed up with Anturus Education – a Welsh organisation that uses expedition, media and adventure to inspire kids to learn about the natural world. 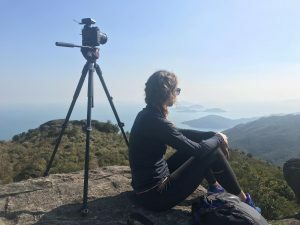 Our mission was to use film and public speaking to demonstrate that Hong Kong is far more than just an urban hotspot – it is in fact, a thriving wildlife hotspot with many nature-filled surprises! Science communication is all about getting the public involved in scientific concepts and research findings — engaging them to take notice of the things that matter and spark curiosity. Whilst we were there, we quickly became aware of the value of being creative in how we communicate science. 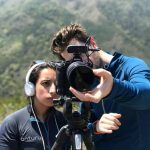 Here are our thoughts on how filmmaking and different styles of presenting can reap meaningful rewards among your target audience. 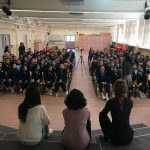 As well as delivering 30 school shows across Hong Kong, the Anturus team also filmed and produced a fifteen-minute documentary and a few shorter one-minute clips for YouTube. These videos were disseminated to schools and the public through the Anturus website and provided useful resources that teachers could access after the team had left, helping the team achieve a legacy once the project was complete. As a science communicator, film and video is an incredibly useful tool – it can provide a sense of escapism, a new way to visualise information with animations, or an immersive experience in interactive 3D. Film can provide a platform for scientists to share their work and promote themselves as experts in a field, and it also has the potential to reach vast audiences and can impact an audience’s emotions as well as their knowledge on a topic. 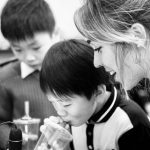 I first became interested in using film to communicate science whilst taking part in the Science on Air and on Screen module, as part of the MSc in Science Communication; since then I’ve created documentaries on plastic pollution, drought research and most recently, filmed presenter-pieces in Hong Kong. Storytelling is an integral part of film and science communication films are no different. How we perceive the world is heavily influenced by forms of entertainment media, such as sci-fi novels, fictional films and documentaries. These depictions of science encompass more than just facts, but they include other elements of science such as its methods and allow non-scientists to ‘see’ where science happens, who does it, and how it works. When choosing a problem or focus for a film, it makes sense to consider the issues and themes and anchor those ideas in contextual evidence to create emotional appeal and build interesting discourse. World-class natural history documentaries, such as Blue Planet II, have gathered popularity as they follow key principles to engage interest in their audience. Choosing a subject which an audience can relate to (living creatures), they showcase surprising beauty and hidden stories in the real world, and they have substance to reinforce that initial generic interest. Don’t underestimate the value of your academic qualifications. Science production companies are always looking for people who are highly qualified in an academic area and are good writers. You don’t need to go to film school. 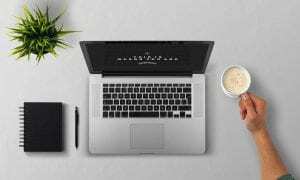 A qualification like the MSc can teach you most of the basics, and there are millions of excellent (and free) tutorials on YouTube. Try searching ‘documentary filmmaking’. Practice makes perfect. Make your own stuff, even if it’s a small project about something down the road from where you live. All the gear…no idea. Don’t spend tonnes of money on expensive equipment that you don’t need. Learn with what you have first – Sophie created a 22-part vlog series using just her iPhone! Keep it simple. Make sure you don’t cram huge amounts of information into a film – there should be a main idea or two, with a sequence of ideas to hold the viewer’s attention and lead them to the end. 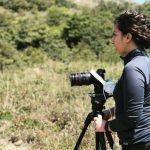 Science can be communicated in many different ways, but I have enjoyed communicating my adventures in the natural world using contemporary media and online platforms. Since my rather quirky trek around Cornwall for my MSc project, I’ve been surprised with how much I have enjoyed presenting as a route into science communication – especially as I’m not the most confident of people! By talking through a topic out loud – I find that I not only offer information to others, but I have learnt so much through the process of film production and presentation. The research that goes into a script, the hours spent modifying it before delivery, help you to think about an environment, a process, a species of wildlife, much more creatively. Your ultimate goal is to leave the audience with more knowledge of a subject or an enlightened view on an issue than before – and so by dissecting information and identifying the key points to present, in a way that is interesting and understandable, well, you end up learning a huge amount! 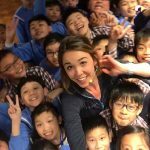 Our presenting experience during Hong Kong was two-fold: pieces to camera and live presentation across 30 schools – both completely different methods of communication and new experiences for me! 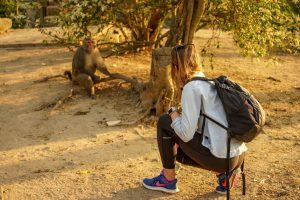 The documentary sought to uncover the wilder parts of the city and reveal the complex relationship the locals have with its wildlife. 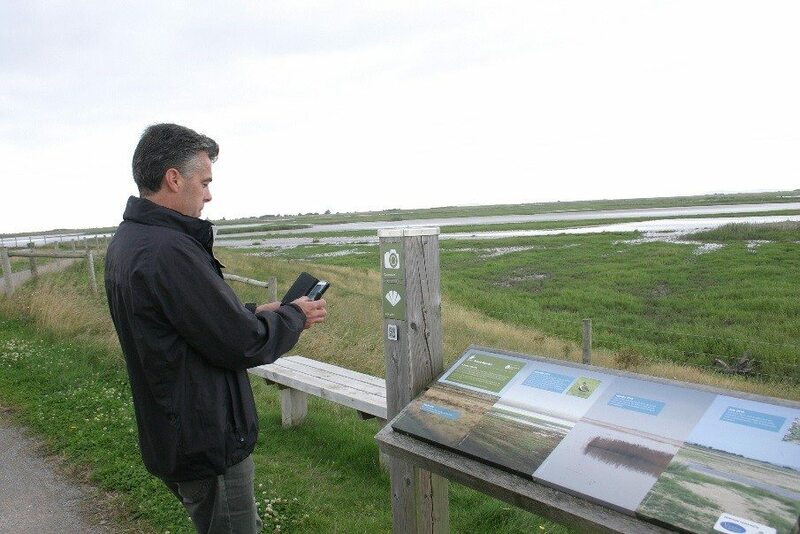 My job was to research what wildlife was in store for us during our visit. Learning about the natural history of Chinese white dolphins, black kites, Rhesus and Long-tailed macaques, was a refreshing change from the garden birds and local kittiwake colony back home! Being part of a small, inter-dependent production crew was also a valuable opportunity; making a welcome change from being a one-woman filming team as I am for my online content. Learning from our trip leader Huw James about shot composition, different presenting angles and even things such as stance, breathing techniques, voice cadences and body language; offered invaluable on-location hints and tips as to how to boost your chances of gaining and maintaining the attention of your audience. If there’s one thing I remember from the MSc Science Communication, it’s that knowing your audience is EVERYTHING. Following the first few days of filming in some impressive national parks such as Sai KunGreatand secondary schools. Here was our chance to now personally interact with our audience, to initiate that all-important dialogue that is integral to effective science communication. Our tour formed part of the Hong Kong Science Festival, coinciding with Science Week back in the UK. Organised by the Croucher Foundation which aims to promote science communication and teaching over Hong Kong, we had quite the schedule! 10 days. 30 different schools. 30 shows. Travelling in-between. I arrived having never done a live science show before – it was safe to say my last stage performance may well have been Villager Number 5 in the school nativity!! Many of the schools required translation into Cantonese – adding an extra hurdle to the learning curve. Being a team of three co-presenters worked well; while two presenters steered the show, the other became the stage hand. It also meant that I could spend the first few shows nursing a lost voice and learning from Huw and Tay, both of whom are far more experienced with delivering science content on stage. The shows were largely based around ‘Our Wild World’, covering everything from deep-sea adaptations of the blobfish, how to be more ‘plastic-smart’, to exploring how volcanoes and glaciers interact. The Hong Kong students were a dream to present to – polite, attentive and practically bursting with enthusiasm to volunteer for on-stage activities and ask questions; it was an opportunity I relished as someone so fresh from education myself, to interact with such eager students and try and inspire them to further their curiosity in science and the natural world. It was wonderful to see the children’s reactions to seeing photos and film of awesome nature – my favourite being their reaction to seeing clips from our documentary of the azure waters of the Geopark and its dramatic coastline, as many of them were not aware of its proximity to their home. We soon realised the apparent disconnect Hong Kong has with its natural land, particularly during one bizarre moment with a teacher, who was asking us for recommendations on which national park to visit! Just go for it. Nothing is harder but more important than just getting over those first few hurdles of getting your content out there. Experiment with different styles – but just practise, practise, practise. Take every opportunity you can to speak publicly, grow in confidence and learn your style. Do your research. As a science communicator its so important to do your research and be sure you’re conveying the correct facts to your audience. Keep your facts accurate – but keep them snappy and interesting. Be creative. This industry is competitive. Try to think of stories or angles to present that are different and innovative – give your audience something remember and your cameraman/woman something fun to film. Network. The MSc Science Communication has been amazing for meeting likeminded individuals who are passionate about the same ultimate goal. 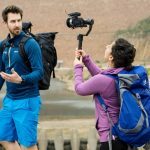 If you want to try out presenting, see if you can find someone who wants to practise their filming and plan some fun filming trips together. 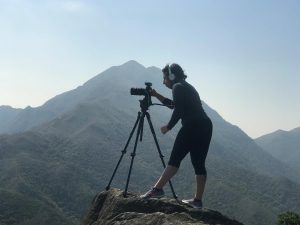 Overall, as newbies into the science communication world, Hong Kong offered a vibrant, challenging and fascinating experience to develop technique and learn an invaluable amount about the various elements that form a documentary and a science show. Follow us on social media @scicomm_tay and @sophiepavs– we’d love to hear from you! Tay Aziz is a passionate science communicator, physiologist and filmmaker. 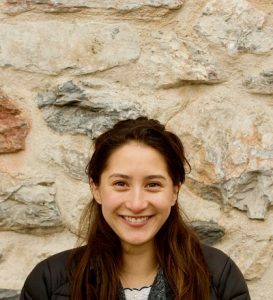 She is currently working as a researcher for the BBC’s Natural History Unit and is the curator of STEMinist, an online community to empower women and girls in Science, Technology, Engineering and Maths. Sophie is an adventurous zoologist with a passion for using expedition to learn about the natural world. 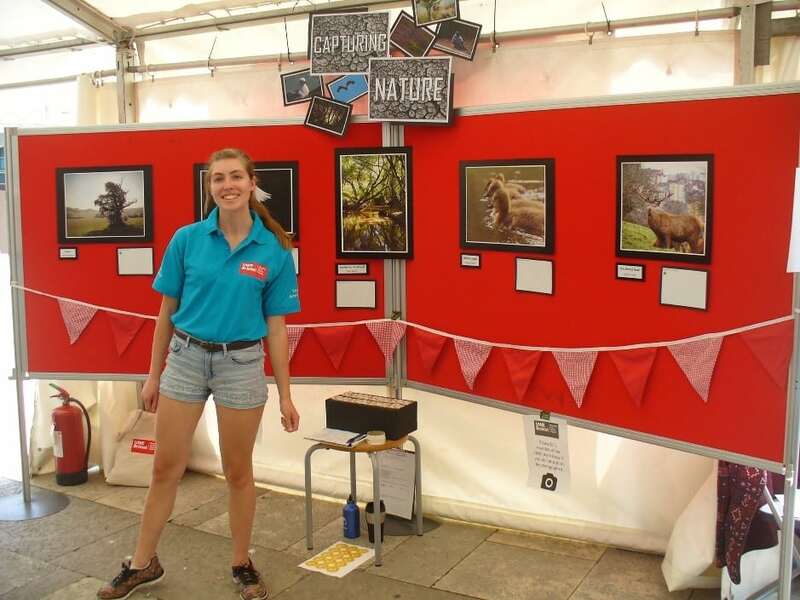 Sophie regularly explores the UK and overseas, sharing fun stories about wildlife and conservation through social media, writing, public speaking and workshops. Sophie’s next project will involve working alongside The Wildlife Trust’s, making some online content for their 30 Days Wild Campaign in June. She’ll also be running digital content workshops for the City Nature Challenge in Bristol and speaking at the Festival of Nature. Sometimes I am amazed at how life just seems to fit seamlessly into place. You have to take a step back on the odd occasion to see how every step has added to the goal that you may still not see. I was always fascinated with the sea from a young age. It captivated me, fuelled my curiosity, and enticed me to explore its depths and this caused me to pursue a degree in marine biology. To be totally honest, I didn’t really know what I was going to do after I had completed my childhood dream of studying marine biology but my part-time job at the National Marine Aquarium ignited a passion in communicating to visitors the incredible creatures of the sea. By my final year at university I became aware that, despite us still discovering novelties in science and marine biology, many people were unaware of some of the most crucial threats our oceans were facing. I found out about the MSc Science Communication at UWE Bristol, and knew that I needed to learn more about how to bridge the gap between contemporary science and peoples’ perspectives of the seas around them. 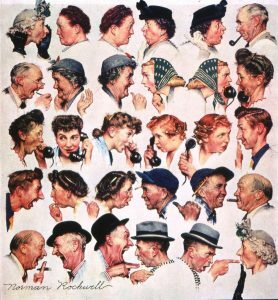 When I started the MSc I quickly found out about the complexities of communicating current research to the “public” and started to understand why it was so hard to initiate change. However, after six months in the MSc programme I needed to decide what I’d do for my final project. I hadn’t found a subject matter that resonated with me and I didn’t want to carry out a project on something for the sake of completing my Masters. It meant more to me than that. Again, life gave me an answer. On a complete whim, I applied for a scuba diving scholarship, which happened to be one of the most prestigious awards that could be bestowed on a young person seeking to forge a path in the underwater world. The Our World Underwater Scholarship Society offers three scholarships a year; one in North America, one in Australasia and one in Europe. I was lucky enough to be the 2017 European scholar, sponsored by Rolex. At the time I wondered why I had been picked out of so many others. And now I truly believe it was because of my time spent on the MSc course, studying a programme which combined my love of marine science, with communication, social science and practical engagement skills. It gave me the chance to redirect myself and see where I wanted to be. The scholarship now presented me with time to put it in action, to be at that forefront of scientific discovery and learn from others who were taking theory to practice. And so, with the MSc course being so flexible to my needs, I put my final project on hold and began my year of adventure into the blue! Ascending back to the boat from 6 hour dives in Micronesia. Photo credit : Prof. Andrew Baird. In the last 12 months I’ve learned new techniques in both diving and underwater photography and have been privileged to travel to some of the most stunning marine landscapes on the planet. 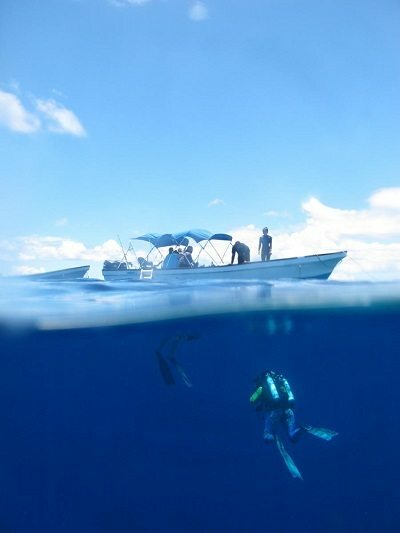 These have included exploring mesophotic reefs (the twilight zone) in Micronesia, diving with bull sharks in Fiji, conducting repellent tests on Great White Sharks in Australia and clearing up ghost fishing nets from Wellington Harbour in New Zealand. I also, for a short while, left behind my diving gear and joined a bike tour around New Zealand carrying out school outreach on plastic pollution. 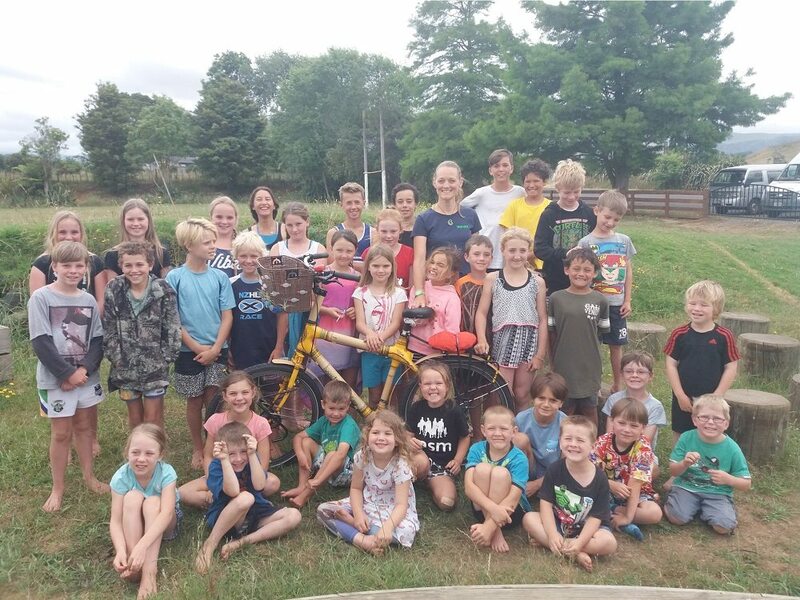 Joining Libby Bowles (Treadlighter) on her cycling mission around New Zealand, Mae was able to join Libby and her bamboo bike to talk to schools about plastic pollution. It has been an incredible journey and throughout it, my project has always been at the back of my mind. 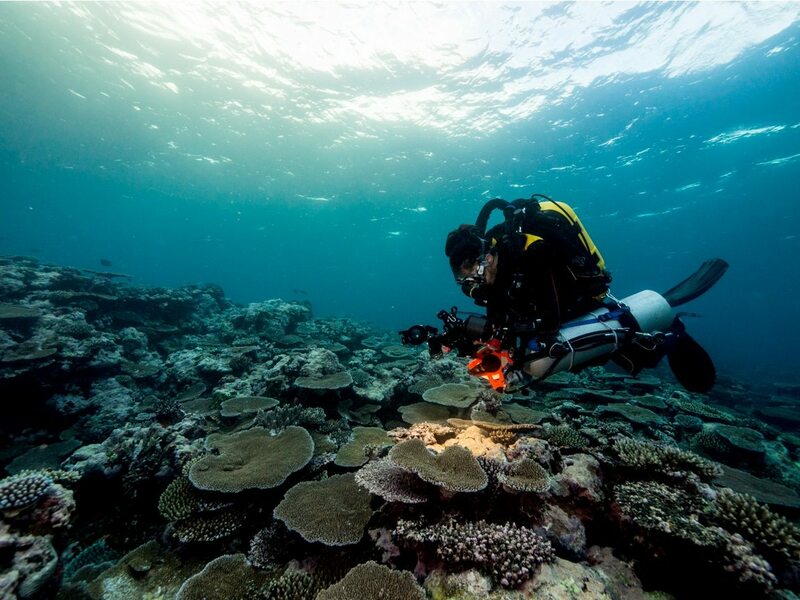 In Micronesia, I was able to participate with award winning scientists in talking to local college students about their reefs. In Australia, I was able to change people’s opinions of the most iconic and misrepresented predator, the Great White Shark. In Fiji, I witnessed locals, who would have in the past sold sharks as a commodity, instead help volunteers tag sharks and release them back into the wild to try and understand where the sharks give birth in their local marine environment. 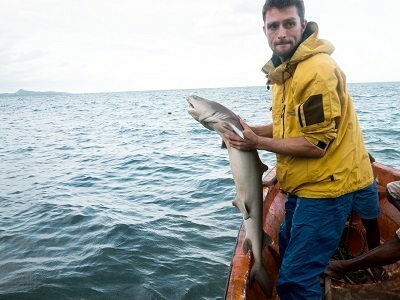 Lead Scientist Gauthier Mescam of Projects Abroad – Fiji, awaits for the all clear before releasing a tagged white tip shark back out into the sea. 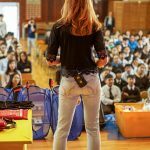 Without always realising, I have been communicating science and conservation issues throughout my blogs and social media presence, which have not only showcased the beauty and mysteries of oceans but have also rallied my family and friends to start to make changes in their own lives, especially in terms of plastic pollution. I am now almost spoilt for choice in terms of ideas for my final project, and as my scholarship year comes to a close, I am excited to return to UWE Bristol for my final project, knowing once again that every step of the way I’m getting closer to where I want to be… even if I still don’t know quite where that is yet. 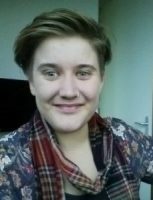 Mae Dorricott is an MSc Science Communication student at UWE Bristol with a BSc in Marine Biology. 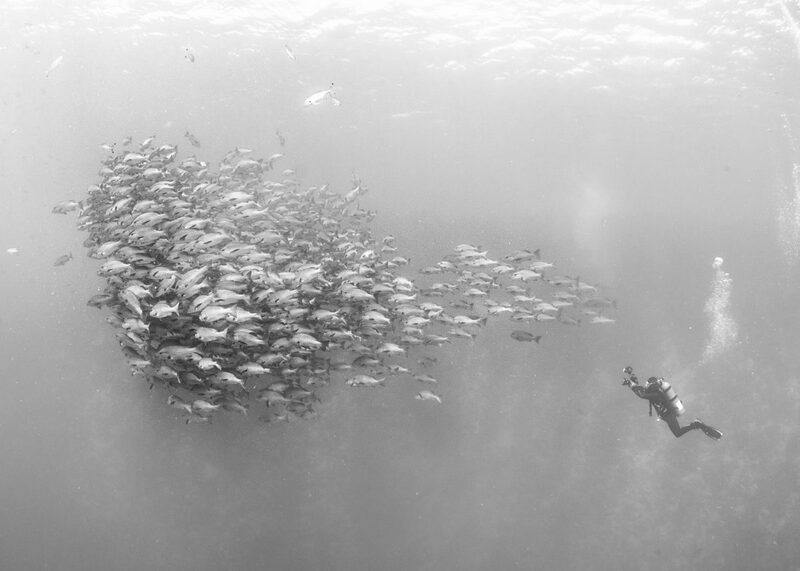 Diving since the age of 12, she has always been passionate about the sea. The Masters programme contributed to her winning an international diving scholarship that provided the perfect space for her to explore the seas and initiate ideas for her final year project. You can find out more about Mae’s experiences at https://owusseurope.org/ and via Instagram at ‘maekld’. Standing behind the counter of Cheltenham Library one Saturday, a colleague beamed at me “Let’s do a Fun Palace”. I had no idea what she was on about. Was she suggesting a new craze I hadn’t heard of? Hmmm, she already works as a Science Communicator so was it something along those lines? My eyes darted around looking for hints – I came clean, I hadn’t the foggiest idea. Turns out Fun Palaces is an international campaign, bringing science, art, craft and tech together for one weekend a year, free for everyone and run by the community. Libraries are community hubs. In the Gloucestershire service, we offer more than books. A Fun Palace fits in well here. Once I knew about Fun Palaces, I enthusiastically agreed to help since it tied in to the skills I had been developing on the Science Communication MSc here at UWE. As long as it could wait until after all my assessments were handed in of course. My colleague wrote a proposal, we were given the ‘nod’, and away we went. So which modules and skills from the MSc were invaluable for the event? I cannot decide. I filled this post with important aspects of the course, then realised no one wanted to read a thesis on this. Basically, I used skills learnt from every module. The experiences provided by Science in Public Spaces (‘We the Curious’, the Explorer Dome, training by VOX and a self-selected visit to one of the Science Museum ‘Lates’) were extremely useful in highlighting how some ideas work well in some spaces and for some audiences, but not others. It also provided practical skills via the BoxEd project. Writing Science came in handy when it came to publishing promotional tweets, producing marketing materials and writing a last-minute media release. The compulsory modules provided an understanding of audiences, whether people feel able to engage in STEM and how you can get around those who feel they can’t, and the Two Cultures debate. Placement programmes in the North East of England. I have come to the Science Communication Unit after completing a PhD at the Artificial Intelligence Lab at the VUB in Belgium, and a PostDoc at the Max Planck Institute for Psycholinguistics. My work throughout both my PhD and PostDoc was primarily on the evolution of linguistic structure. One method I have used in my research is cultural transmission experiments in the lab. 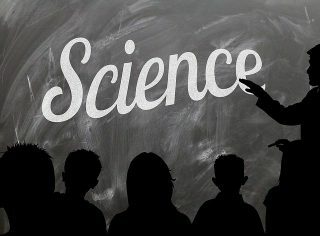 Every two years, the Association of British Science Writers (ABSW) hosts its one-day Science Journalism Summer School. The 2017 event took place on 5 July at the Wellcome Trust in London, and I went along as a budding freelance science writer to learn a few tricks of the trade. I was joined by 135 other delegates on the airy and light sixth floor of the Trust’s superb glass-fronted Euston Road building on one of the hottest days of the year. With me were undergraduates, PhD students, freelancers of many kinds, and established science journalists working for a range of organisations. Oh – and a colleague (Clare Gee) from my Masters course in Science Communication here at UWE! Billed as a 12-hour working day, I indeed arrived for coffee at 9am, and did not depart until 8.30pm after the superb networking session with commissioning editors from a number of science publications, such as New Scientist. BBC Science Correspondent Pallab Ghosh opened the proceedings, and the format for the rest of the day followed short talks with panel discussion and audience Q&A. We learned about new media trends, particularly around digital news consumption, in the context of the question ‘Where have all the science correspondents/journalists gone?’. ITV’s Science Correspondent Alok Jha extolled the virtues of critical science journalism in the fake news world, asserting the need to communicate conflicts between scientific researchers and cast more light on the imperfections and uncertainties of the scientific endeavour. That doesn’t sit so easily with being a proponent of science, which most of us are. A session on pitching skills was most revealing, with commissioning editors suggesting that they aren’t receiving enough news pitches (short 250-word pieces) alongside the veritable flood of feature pitches. They were keen to point out that background was largely irrelevant; if the story was good and the source reliable, they’ll take it. And one particularly good tip to remember is that editors often prefer to receive a ‘phonecall, with e-mail used as the follow-up. The session on investigative reporting left a sense of how good for society the best journalism can be, despite the challenges around funding this type of work in today’s climate. Given the potential risks, freelancers were generally advised to steer clear of investigative reporting! Perhaps the highlight for me was the final session on “successful freelancing”. There were personal testimonies of the struggle to get going, to find sources of work, to carve out a niche area of specialisation. Max Glaskin, the successful, award-winning author of the magazine Cycling Science, offered a tremendous insight laced with some dark humour along the way. His successful writing career has allowed him to diversify his sources of income through giving talks, chairing panel discussions and undertaking specialist scientific consultancy. All-in-all, a long but rewarding day, worth every penny. If you want to meet several commissioning editors in one place at one time and establish relationships, then this biennial Summer School is a good investment of your time and money.